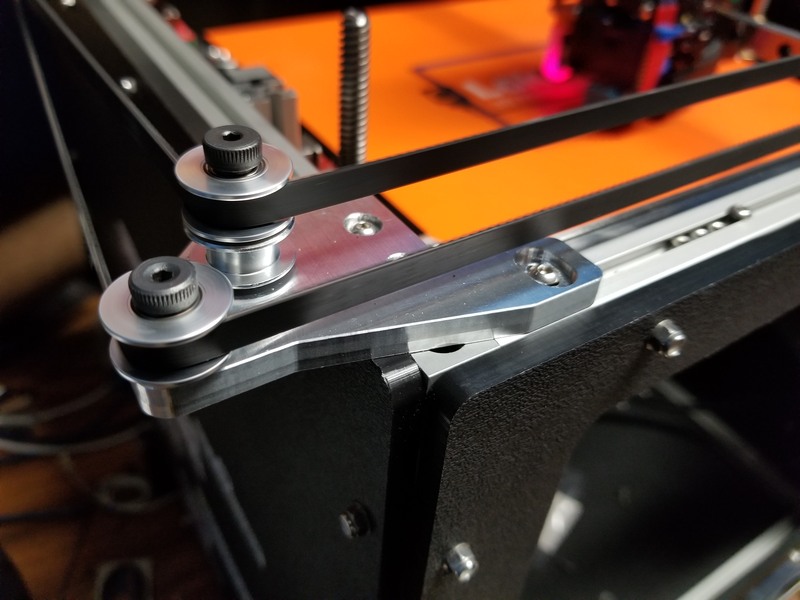 Regarding leaning Idlers & "Belt Walk"
Re: Regarding leaning Idlers & "Belt Walk"
A self-described "expert" on belt-driven printers suggested that securing the idlers on only one side is sure to create problems over time, even if they are mounted to metal plates. In the 4 months since you made this post, would you say the new metal parts were sufficient to permanently solve this problem? I've seen zero evidence of the idler stacks leaning. The shoulder bolts haven't deflected, nor have the mounts. I don't see the belts rubbing on the top of the idlers at all. Excellent, I imagine it would take a lot of tension on that little belt to actually bend an M3 like that. What's stopping someone from stacking both belts on the same vertical post in the picture above? If you had a thrust bearing between them and did the same for the X carriage idlers, would there be any other problems I'm not seeing?